What, exactly, do we know for certain about the fourth Jurassic Park movie right now? Well, it's officially titled Jurassic World, with Colin Trevorrow confirmed to be directing and shooting the film in 3D for a Summer 2015 release. Not to mention, the original script draft written by Rick Jaffa and Amanda Silver (Dawn of the Planet of the Apes) is reported to have been significantly revised over the past several months, which is why the project was delayed from its previously-set 2014 premiere date in theaters. Plot-wise, it's not clear if the central premise from an outdated JP4 script draft - where, in the present-day, Jurassic Park is now fully operational... until it's not - has been maintained in the Jurassic World screenplay; or, rather, if that version of the film predates even Jaffa and Silver's involvement. The title suggests that the former of those dual scenarios may be accurate (would Jurassic World = SeaWorld, albeit with dinosaurs instead of sea critters? ), but that speculation is... well, just that: speculation. However, what we can say for certain is that Bryce Dallas Howard has begun talks to play one of the central human roles in Jurassic World, now that multiple outlets are confirming the news (including, Variety). The award-winning actress (and daughter of filmmaker Ron Howard) has amassed strong performances outside of the blockbuster circuit - for example, in M. Night Shyamalan's The Village and Kenneth Branagh's As You Like It adaptation - but she's had a run of bad luck, on the maligned and/or under-performing tentpoles Spider-Man 3 and Terminator Salvation. We'll see if that rough trend stops with Jurassic World, following Howard taking a year off from acting to start a family. As far as reasons to remain optimistic about Jurassic World go, Trevorrow has spent even more time revising and (hopefully) improving the screenplay, with assistance from Derek Connolly (the screenwriter on Trevorrow's acclaimed directing debut, Safety Not Guaranteed) and notes from executive producer Steven Spielberg. In addition, the Variety report mentions that there is "one more big [human] role to cast," before pre-production continues to move forward - allowing the chance to cast another solid actor to pick up where the series' previous leads (Sam Neill, Jeff Goldblum and, to a lesser degree, Laura Dern) left off. 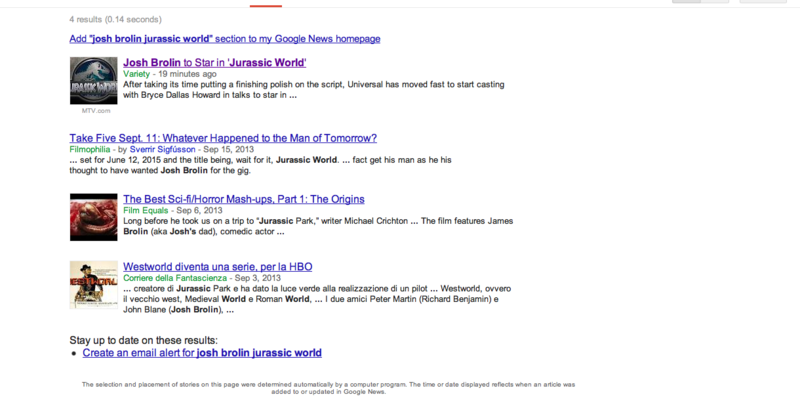 Variety initially claimed that Josh Brolin (Oldboy (2013)) was joining the Jurassic World cast, before removing the original link and title that included his name (here is a screengrab to prove we're not lying); the indication being, that was either a mistake or something that cannot be verified until further notice. Similarly, before the project was pushed back from 2014, there were rumors about both Howard and David Oyelowo being eyed for roles. However, the latter has since joined the voice cast for the Star Wars Rebels TV show and (reportedly) auditioned for Star Wars: Episode VII - which is to say, the actor may no longer be a feasible option for Jurassic World casting. Could Josh Brolin be in consideration for a role in 'Jurassic World'? The Screen Rant Podcast team has discussed in depth why Jurassic World is a dicey prospect, arriving so long after the first two Jurassic Park sequels achieved mixed success (artistically-speaking) - between the first half/three-fourths of The Lost World: Jurassic Park and the amusement park thrill-ride of Jurassic Park III - yet, neither fully justified the expansion of themes and story from Spielberg's self-contained original film into a franchise - again, in a creative sense (given that Jurassic World makes $en$e from a box office perspective). Take that (or leave it) as you will.